Applications for summer 2019 will be accepted from Nov. 19, 2018 through Jan. 11, 2019. The Summer Training in Academic Research (STAR) Program provides a high-quality research experience for undergraduate students, high school students, and middle and high school teachers during the summer academic break. The eight-week program, held June 17 - Aug 8, 2019, will give participants who are interested in science and medicine real hands-on experience in research methodology and writing. Participants are placed in teams and matched with Duke faculty mentors to work on an original, hypothesis-driven project, originating as a one-page summary and culminating in a complete research paper. A goal of the program is to have every participant qualify for co-authorship on a peer-reviewed manuscript related to their team’s project. 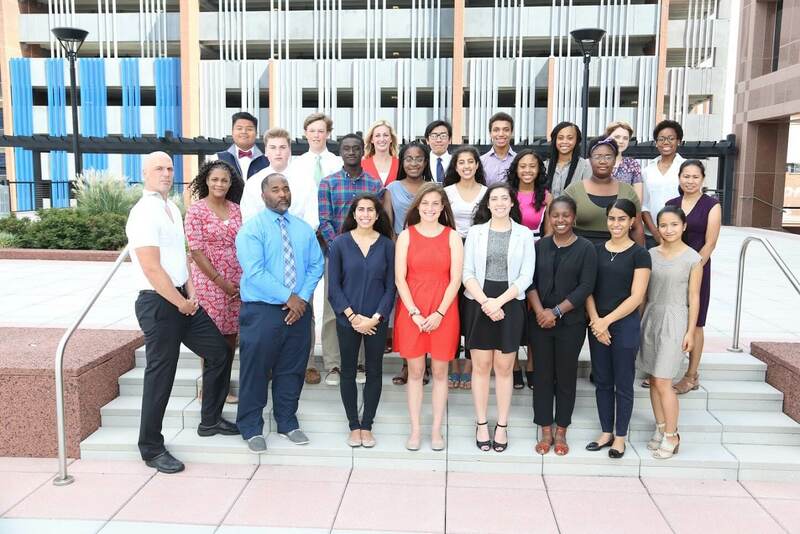 The STAR Program is held at the Duke Clinical Research Institute in Durham, N.C., which has organized educational and support programs for junior faculty, fellows, residents, and medical students as well as high school and college students. Participants receive a stipend to attend, which makes the program an option even for students who planned to work over the summer break. (see below). Download the fact sheets for students and teachers for more information. In the first two weeks of the program, participants meet with their faculty mentors and develop a specific question or issue related to the uses and effects of a particular medication. The teams then perform a thorough review of the literature and develop an in-depth description of the research question. Eligible students (age 18 and above) also experience clinical medicine firsthand by shadowing a physician on hospital rounds. During weeks 3–8, the teams develop a thesis consisting of a description of the research question, aims, methods, figures/tables, results, and discussion for their specific project. Throughout this time, a medical writer provides tutorials on developing a scientific manuscript, a statistician provides lectures in applied statistics and works with students to analyze data, and Duke medicine and pediatrics faculty members give lectures on neonatology, antimicrobial therapy, and pharmacoepidemiology. The program also includes a medical ethics seminar on the responsible conduct of research. To review progress and ensure the scientific validity of their work, program participants meet with their mentors weekly. At the conclusion of the program, teams do a formal presentation and complete a written thesis of their project. The papers are included in articles submitted to peer-reviewed scientific journals, meaning that the participants have the potential of having their work published. Duke's STAR Past Participants: Where are they now? Publishing research can be a critical step toward a scientific or medical career. It provides recognition from the scientific community and an opportunity to build relationships with others who are doing research in the field, who can provide feedback and offer ideas for future research. Publishing also provides the opportunity to get results out into the world. Even if research findings are groundbreaking, they will not make any difference if no one knows about them and cannot apply them to real patients. Association of Atrial Septal Defects and Bronchopulmonary Dysplasia in Premature Infants. Association between Furosemide Exposure and Patent Ductus Arteriosus in Hospitalized Infants of Very Low Birth Weight. In-hospital outcomes of premature infants with severe bronchopulmonary dysplasia. The program capitalizes on world-renowned training programs in place at Duke University under the leadership of Danny Benjamin, MD, PhD, professor of pediatrics at Duke and associate faculty director of the Duke Clinical Research Institute. Other faculty in the STAR Program are actively involved in NIH-sponsored research in clinical pharmacology, therapeutics, trials, and pharmacoepidemiology. Combined, these faculty members have more than 200 publications on which trainees are listed as either first author or co-author. The team of instructors also includes a writing instructor, a statistician, and operations staff. View profiles of the instructional team members. Middle and high school teachers, rising junior and senior high school students, and undergraduates are encouraged to apply. No prior experience in research is necessary. Applicants only need to demonstrate strong academic performance and an interest in science. U.S. citizenship or permanent residency is required for participation (per NIH policy). The STAR Program is committed to ensuring a diverse participant group. Consistently around 50 percent of the class is made up of underrepresented minorities. A stipend is provided to participants, which makes the program an option even for students who planned to work over the summer break. High school students receive $2,600. Teachers participating in the program are also compensated for the 8-week commitment. The only costs associated with the program are housing and transportation. Participants are responsible for securing their own room and board. Completed application for high school or college students *Note: Please use Firefox or Safari for best performance when downloading these applications. Two letters of support provided by non-relatives *To be emailed by the letter writers. Teachers are a critical part of the STAR Program. Their primary responsibility is to create an open and collaborative learning environment, and contribute life experience, collaborative skills, problem-solving skills, and content-based knowledge. Completed application for teachers *Note: Please use Firefox or Safari for best performance when downloading these applications. A letter of support from your institution plus one additional reference *To be e-mailed by the letter writers. Submit all materials by email to STAR Program Coordinator Divine Pinson.